Located towards the southern end of Sarasota County, just south of Siesta Key, Casey Key offers a private, picturesque, tropical vacation destination unlike any other. Known for being “Old Florida” at its best, Casey Key doesn’t feature any huge, chain hotels. Instead, you’ll find quaint inns, a short stroll from the public beach and marina. Casey Key offers the beautiful, warm waters of the Gulf to enjoy. 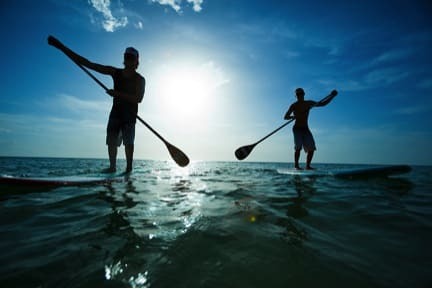 Whether you want to take a sunset tour on a jet ski, try stand up paddleboarding, or fly high above the waters with parasailing, Casey Key offers plenty of ways to enjoy the beach beyond lounging in the sand. Nokomis Beach on the barrier island of Casey Key offers picnicking, fishing, boating, paddleboarding, and volleyball. It has also recently restored a beach plaza that was originally designed and built in the 1950s by the Sarasota School of Design. Spanning 30 acres, Historic Spanish Point is an “outdoor museum” on Little Sarasota Bay. Visitors can kayak or paddleboard through the waters the Native Americans travelled 5,000 years ago. Enchanting, family-centred experiences include Mrs Potter Palmer’s Jungle Walk, the Sunken Garden, and one of the largest butterfly gardens on the Gulf Coast. With its 15 miles of trails surrounded by Flatwoods, Oscar Scherer State Park near Casey Key is one of the best spots in Southwest Florida for viewing scrub jays (an indigenous, endangered bird). The park also has swimming, picnicking, hiking, bicycling, camping, and wildlife viewing opportunities. Staying on Casey Key has many advantages. Walking to the beach, or perhaps down to Casey Key’s own drum circle to take in a beautiful sunset, are just some of the opportunities you have while staying on in this quaint part of town. For more information on Casey Key or the vacation rental properties we have available there, contact Jennette Properties today.